By the late 1920’s Ireland was in a state of disarray from the Irish war of independence. The British forces of the the Royal Irish Constabulary along with the Black and Tans and the retaliated against the IRA and Sinn Féin. In Ulster the IRA were not only fighting the British but they had to take on the role of defender of the Catholic population against Protestant pogramists, particularly in Derry and Belfast. The UVF was resurrected by the Ulster Unionist Council which was led by Carson and Craig. The UUC then set about the formation of a police force which was predominately Protestant. Following the IRA killings of Oswald Swanzy in Dublin and RIC Divisional Commisioner, Colonel G. F. Smyth in Cork, the Catholic populations of Banbridge, Lisburn,and Dromore were expelled in 1920 with members of this new force participating. British Prime Minister Lloyd George gave permission in September for the formation of a new three tiered police force, the Ulster Special Constabulary, which would operate only in the 6 north eastern counties of Ulster. The reformed UVF joined them in droves and though there were no official bar on Catholics joining it was intimated that they were not welcome, and that included Catholic RIC members transferring over. 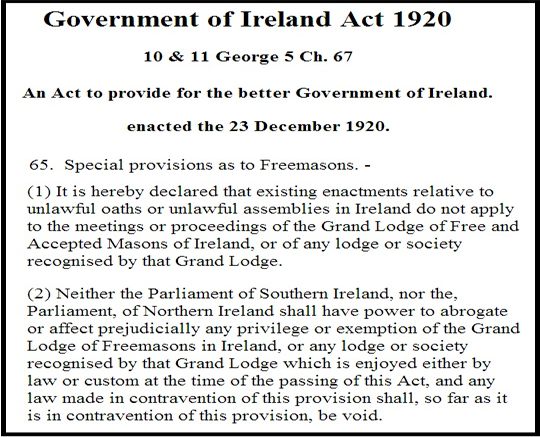 In December of 1920 the British government introduced the Government of Ireland Act 1920 to provide for the better government of Ireland. This act provide for two home rule institutions in Ireland. One was for the formation of Northern Ireland consisting of the counties of Londonderry, Antrim, Tyrone, Down , Fermanagh and Armagh. This would ensure a state in which the Protestants would have an unassailable majority. The three remaining Ulster counties of Donegal, Monaghan and Cavan would join with the rest of Ireland to form the second and larger institution of Southern Ireland. Both jurisdictions would remain as part of the United Kingdom with a provision for future reunification in the formation of a Council of Ireland. The act disappointed nationalists and unionists alike but they were to put it to use. For both Catholics in the north and Protestants in the south there was a feeling generated of despair and abandonment. By may of 1921 Northern Ireland was formed with the partition of Ireland a few months before the signing of the Anglo-Irish Treaty that would see an Irish Free State but also result in a Civil War in 1922. A History of Ulster by Jonathan Bardon. The Blackstaff Press. Belfast.2005. The Green Flag. A History of Irish Nationalism by Robert Kee. Penguin Books London 2000 edition.